Notes: Heptapyrgion (Ancient Greek: Ἑπταπύργιον), modern Eptapyrgio (Επταπύργιο), also popularly known by its Ottoman Turkish name Yedi Kule (Γεντί Κουλέ), is a Byzantine and Ottoman-era fortress situated on the north-eastern corner of the acropolis of Thessaloniki in Greece. Despite its name, which in both languages means "Fortress of Seven Towers", it features ten, and was probably named after the Yedikule Fortress in Constantinople (modern Istanbul, Turkey). 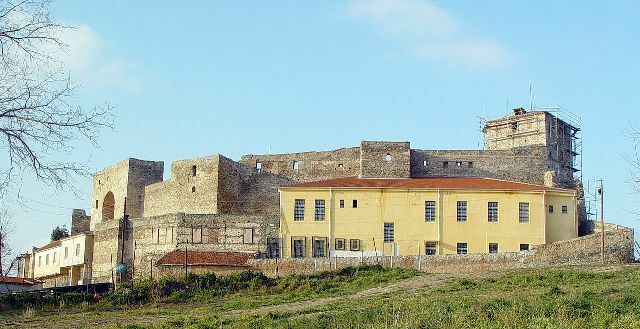 It served as the major redoubt of the city's acropolis, as well as the seat of its garrison commander in Ottoman times, until the late 19th century. It was then converted to a prison (Φυλακές Επταπυργίου), which remained open until 1989. References to the infamous Yedi Kule prison abound in the Greek rebetika songs. Restoration and archaeological work began in the 1970s and continues to this day.